Spirituality, Relationships, Health and Organization. 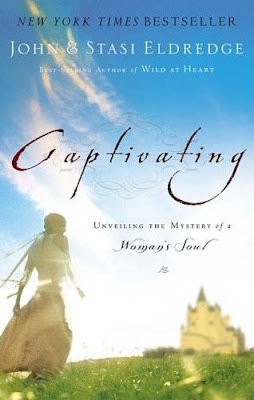 For my spiritual side I decided to begin a study series called "Captivating: Unveiling the Mystery of a Woman's Soul" by John and Stasi Eldredge" and am really enjoying it. I'm a thinker and sociologist at heart so this kind of study comes naturally. Of course my brother says I could analyze the word "hello" to death...I call it being observant (: I'm just getting started, but can see it moving deeper soon. We'll see if I'm so jovial about unveiling the mystery of my heart in the days to come. I also decided to join a Friday morning women's Bible study and it was wonderful!! I met a lovely group of ladies who made me feel right at home the moment I entered the room and I look forward to continuing the fellowship. There's nothing better than a group of gals getting together to worship and support each other. The one bump in the road this week had to do with my relationship focus. Last week I wanted to begin a journey of seeking ways to honor my Mom each day. We've always had a strong but rocky relationship...it's because we're so much alike, but yet so different at the same time. We call it the "is it blue or green" syndrome. We can be saying exactly the same thing, but in two totally different ways. This leads to one thinking the other is not fully understanding what is being communicated. I may be saying "blue," but she's hearing "green" and vice versa (: I think it's a universal mother-daughter relational issue and Saturday was one of those times. Health last week was pretty simple...I made a mindful effort to drink water and take vitamins each day (lately I've been so slack on this!!). I also added rebounding to my exercise list plus increased dog walking an additional 5 minutes. I have a heel injury and have to really be careful to not do too much at one time. Breaking it up during the day helps. Since that time huge amounts of purging and donating have occurred and now Mom and I are sharing the same space. Grandmother's room has become my studio, but I haven't been able to get things together in there. I think totally changing the space is a reminder she's no longer here. But it's time to move on and so I started small by purging things from the studio, began redesigning the closet storage and donated books and magazine from my library. As this process continues I'll post photos of the progress.